When a young boy named Pin Pin (Bin Bin) (yes, you read that correctly. Bin Bin plays Pin Pin. What did you expect?) befriends a green, glowing crystal that can communicate with humans by intercepting their brainwaves, a series of Martial Arts battles - as well as wacky comedy scenarios - ensue. The evil KGB want the crystal, and the nefarious Karov (Norton) is not messing around. Cindy Morgan (Rothrock) is battling him every step of the way. Andy (Lau) is a cop and the older cousin of Pin Pin, and along with Winnie Shen (Cheung) and Pancho (Jing) the three go on a series of misadventures, not the least of which takes them all the way to Greece where the ancient aliens (now seen on the History channel and on DVD) tried to rendezvous with human beings thousands of years ago. But are they done with us? Find out today! 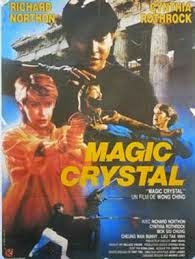 The Magic Crystal is a fun and entertaining joyride that throws a little bit of everything at the viewer. It might not always make the most amount of sense, but it seems making sense wasn’t even in the top 100 of priorities for director Wong Jing. His mandate appears to have been to entertain audiences at all costs (even if coherency is one of those costs). He succeeded. One minute a little kid is chatting with a glowing chunk of goo, then there’s some wacky slapstick with some other characters, then there are some fast and furious Martial Arts fights. It’s definitely a cinematic smorgasbord, and who are we to say no? Obviously, what we gravitated towards here were the fights. They have that fast, cool, inventive style Hong Kong was so great at, especially in the 80’s/early 90’s. You get not one, but two Rothrock/Norton fights, and throw Andy Lau into that mix, and you truly can’t lose. The fast pace keeps things lively and the whole outing has a cool ending. What’s not to love? 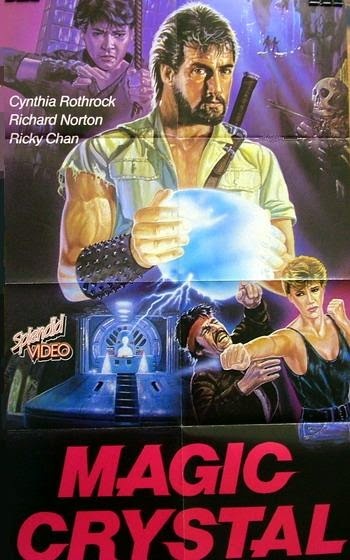 The fact that some of the action takes place in Greece gives things a different feel and look from the average “chop-socky” films of the time, and there’s a lot of cool 80’s style on display, from the music, to the phones, to the cool, pre-CGI effects which actually delight the eye rather than irritate it. There’s the time-honored warehouse fight, and a schoolyard bullying subplot that was very ahead of its time. Fan favorite Richard Norton plays the bearded baddie with aplomb. He’s a KGB man who inexplicably is also a Martial Arts master. This was the first of many Cynthia Rothrock/Richard Norton onscreen pairings, and, as they individually are two of our favorites, we were happy to see their relationship got off on the right foot. You’ll likely have a smile on your face as big as the one on the 3-D poster of Donald Duck that Pin Pin has over his bed when you watch this “Gem” of a movie. When I finally got a hold of this movie, I was disappointed. Sorry, because you obviously like it. The movie can't decide if it wants to be an ET rip-off, slapstick or a martial-arts movie. Final Reprisal with Gary Daniels or Double Target with Miles O'Keeffe were better difficult-to-find movies, in my opinion. Revenge Of The Kickfighter (a.k.a. Return Of The Kickfighter) with Richard Norton is another good rare movie. "It might not always make the most amount of sense, but it seems making sense wasn’t even in the top 100 of priorities for director Wong Jing. His mandate appears to have been to entertain audiences at all costs (even if coherency is one of those costs)." i can't think of a better summary of all of wong jing's movies. haven't seen this one but most of the time they are entertaining. Roger: Always wanted to see Double Target and Final Reprisal. Hard to find. We did get to see Return Of The Kickfighter. We enjoyed that one. Review coming soon. Saturday Night Screening: Thanks! This was pretty entertaining.